A joint report by the International Labor Organization (ILO), and the Free Walking Foundation, and the International Organization for Migration (IOM) showed that the number of slaves in the world in 2018 is 40 million, mostly of which are women and children, with Arab countries ranking fourth at 3.30 per thousand. 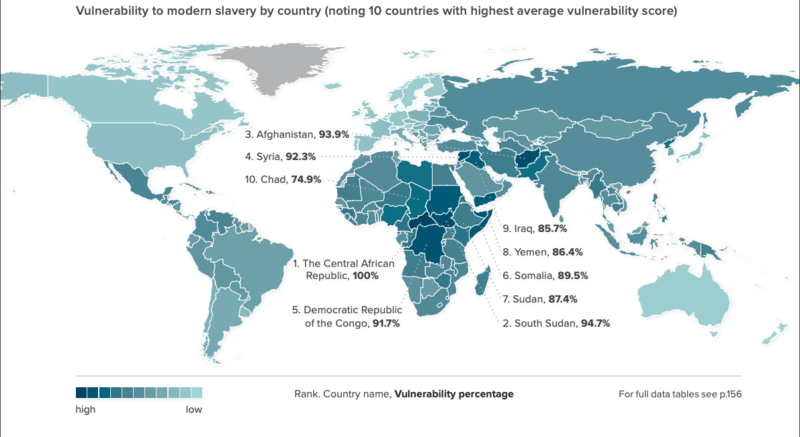 The report shows that five out of 1,000 are victims of contemporary slavery in areas of war and conflict, which increases in economically developed countries. According to the report, the number of contemporary slaves in Arab nations is about 529 thousand individuals, which is 1% of the total number of slaves in the world. Slaves are spread in 11 Arab countries, mainly Syria and the United Arab Emirates (UAE), where 67% of them are forced labour and 33% are forced marriage. Syria has about 76% of the total number of slaves in the Arab countries. For more information check out Global Slavery Index.